Victimae paschali : Easter cantata for SATB chorus and strings / Colin Brumby. 1. Victimae paschali -- 2. Agus redemit oves -- 3. Die nobis Maria -- 4. Orchestral interlude -- 5. Scimus Chritstum surrexisse. Commissioned by Pro Musica Choir. Score: Victimae paschali : for SATB chorus and strings, piano/vocal score / Colin Brumby. Score: Victimae paschali : Easter cantata for SATB chorus and strings / Colin Brumby. 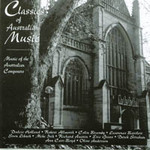 CD: Classics of Australian music.